Simply Be By Night Velvet Dress is rated 1.3 out of 5 by 7. 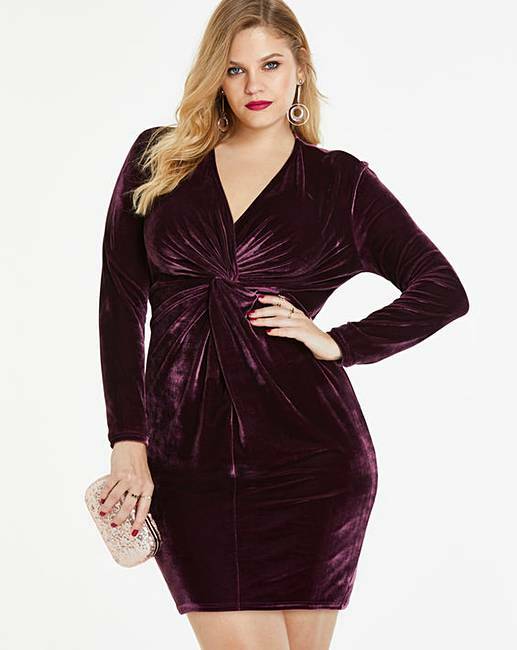 Take on the night in this gorgeous velvet twist knot dress from Simply Be By Night. Cut to a shorter bodycon shape, with long sleeves and a V-neck. In a soft-touch velvet fabric and featuring twist knot detailing to the front, gathering at the waist and enhancing those beautiful curves. All you need is your clutch and heels and the party begins! Rated 1 out of 5 by Chippie2nd from Not as described/pictured The colour is more of a dusky rose, and the knot has too much fabric, making it look like your heavily pregnant. Sent back, refund can't quicker than I expected. Rated 1 out of 5 by hollywyatt from Weird colour! No idea how they managed to make the dress look so dark in the picture, but it is nothing like that in real life! It's a weird pinky colour, and the shape of the front is really baggy. Being returned tomorrow! Rated 1 out of 5 by Kate234 from Colour is horrible I didn't even try this on, I opened it and saw the colour was more of a rose-pink that my boyfriend looked like a "granny colour". Such a shame as the style looked perfect. Sending it back.